"I've been doing your plank row exercise every day! Totally subscribed. I lost 30 pounds this summer before I went back to college, and your channel is perfect for me because now I need someone to teach me how to do weight-stuff and tone. Thank you!!" The Step Ahead team helped me to lose 42 pounds before my wedding. They are truly an amazing team and support system. I will be forever grateful and hopefully returning to continue losing more weight! I joined Bridal Boot Camp because I have tried a million other diets and nothing worked for me simply because I have absolutely no will power. Having an appointment to work out 1 on 1 ensures that I will show up and not only show up but actually work out. Aside from the 1 on 1 workouts, I wanted the opportunity to learn how to prepare better meals so that once I was married, I could maintain my new life style. The cooking classes definitely helped out in this area, because I could taste the food before making it to know if it was something we would want to eat. I learned that my biggest downfall was eating out. This is because of the schedule I have at work and the amount of time I spend commuting. By the time I get home, I don't want to cook so it was easy to just go get something. The cooking class helped here too because almost all the meals are 30 minute meals, and even when you are eating out, it takes about that to decide where to go, get there, order, and then get back home to eat. Knowing some quick recipes helped and learning how to make a better shopping list each week ensured that I always had the ingredients I needed. My biggest motivation in signing up for Bridal Bootcamp was I obviously wanted to look great on my wedding day, but in addition to that, I knew that my future husband and I wanted to start a family right away, so being as healthy as I could be for my baby was definitely important as well. I know the information I have learned at Step Ahead will help me to create a much more healthy lifestyle for my husband and I and soon our children. I would recommend Bridal Bootcamp to everyone and basically have to anyone I talk to. It seemed like a lot of money to me at first, but once I looked around for other personal trainers and nutritionists, it was actually a much better deal. Now after going there, I can tell you, you will not get the same personal attention that you get at Step Ahead no matter where you go. Everyone has a customized program based on their own needs, and Noelle, Sari, and Dr. Neiman all take a personal interest in your success. I lost 42 pounds in just about 7 months before my wedding. I will hopefully be returning some time next year, but I will need to wait as I am now pregnant as planned. I want to return for more Bootcamp after I have the baby. I leave here every month so happy, very motivated and feeling positive that I am in the right place working towards my healthy goal. Thank you! I have been doing the Step Ahead program since 2/07. I am extremely happy with all aspects of Step Ahead. I have lost 25 pounds and still counting. Dr. Neiman and staff have been the best. They take all the time you need to discuss your progress and what you can do to get the most out of your weight loss. Then there is Andy, and he goes above and beyond to give you an exercise program to tone every muscle in your body. Believe me, I know, I felt it! They are all the best and I am looking forward to continuous care. From the first day I came here, I felt like I finally found the right place for me. Dr. Neiman and all of the staff have always been kind, understanding, and empowering. I have struggled with severe obesity for many years and for the first time ever I have lost weight, began to enjoy exercising, and gotten my life back. Words cannot describe my gratitude. Thanks! From the beginning, Step Ahead has been a very different experience for me. To be able to actually "work with" a doctor to achieve a goal is a wonderful feeling! I look forward to my visits now instead of dreading them. 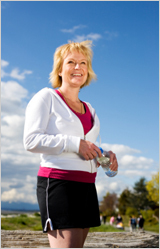 Dr. Neiman and her associates at Step Ahead have far exceeded my expectations for a weight-loss program. At each visit (and even in-between) I feel like I have an enthusiastic team there to offer expert guidance and overwhelming support. While I am losing weight with this program, I am also improving my health, gaining energy, and enhancing my overall quality of like. Thank you! An excellent experience that helps change your life and past patterns. Experts that are empathetic to the "hectic" lifestyle and create a program that can function with a busy way of life. I've tried many things to lose weight with little success at keeping it off. Dr. Neiman is extremely patient, encouraging and understanding. She really takes time to listen and offers advice that meets your personal habits. I've never once felt like I was just another number. Dr. Neiman also covers her bases by providing a nutritionist and personal trainer -- it has really given me every opportunity to target my personal weight loss goals. Her staff is also friendly and non-judgmental. I'd recommend Dr. Neiman and Step Ahead to anyone who is struggling with their weight or may just want to incorporate a healthier lifestyle. It's the balance of nutrition, exercise, medicine and emotional support that make this program a success. My experience with Step Ahead has been extraordinary. My husband looks terrific and is at his goal weight. I intend to follow in his footsteps. I have recommended the program to several friends who are also very impressed with Dr. Neiman and her staff. For years trying to lose weight was always a yo-yo for me. I tried every diet you can think of. My weight always came back. Then I decided to lose weight once and for all. I came to Step Ahead because I needed the support of a medical doctor. This was the best decision I could have made for myself. Step Ahead has a great program and Dr. Neiman is excellent. My very first phone call to Step Ahead along with my first visit was very encouraging. I am never rushed in and out of the office. The receptionist, nurse, personal trainer, nutritionist and doctor all take the time to answer all my questions. Each person put my best interest first and foremost. I really appreciate the kind and caring behavior extended to me. They make me feel like family. Whenever I feel discouraged about my weight, Step Ahead gives me the motivation and encouragement I need. Because of Step Ahead, I have a better understanding of what actually is happening in my body. I know which foods cause weight gain and which foods cause fat gain. This has helped me a lot with how I eat and the food choices I make. After attending Step Ahead for one year, I am lighter, energized and relieved! This is exciting and the best feeling ever. I came to Step Ahead about a year and a half ago. I was seriously overweight, my blood pressure was off the charts, and I felt terrible. I knew I had to do something and didn't just want to do another "fad" diet. The Step Ahead program has been wonderful to me. I lost close to 65 pounds (and continue to lose), my blood pressure is back to normal and... I can't believe this part... I am exercising and eating well, all thanks to the Dr. Neiman and the terrific staff at Step Ahead.